This is Liberty babycord (sometimes called Kingly cord; I'm not sure if that means they think kings are big babies, or what); as usual, I forget the style name. I went to eBay to see if I could find any and ended up buying four more meters of a *different* print, so I think I'll leave it as unknown for now, thank you! The buttons are olive plastic (all the buttons on these three dresses have been just standard off-the-revolving-rack ones from Hancock's Fabrics; I have tons of vintage buttons, of course, but not TEN of any one kind, which makes it a bit difficult to use them up with shirtdresses). I also had a set of bright teal ones under consideration for this dress, but they were a little headlighty against the swirly print. The cuffs were actually not as much of a PITA as I thought they would be; there's a slight bobble on one of them where the brown ribbon that edges the placket meets the cuff proper (which of course I didn't think to take picture of). But considering I move my hands so much when I talk, no one will ever notice. I also have a midriff-y dress made in this same colorway, only in lawn. I can't remember if I've ever posted it, though. Right now it's waiting for a button fix, sadly. Sewing with Liberty cord isn't hard; it's very fine and lightweight, not bulky at all. The print obscures any nap problems and the wales are so fine that you don't get that weird separation you sometimes have at the seams with wider-wale corduroy. Also, it is sooooo soft, like very thin velvet. If you wear Liberty corduroy, people WILL pet you. Be prepared. I used sewn-in organza again for the interfacing; worked fine. It helps the collar keep a soft shape without me having to mash it with the iron (not good for corduroy). And this one, unlike yesterday's version, is VERY warm and looks good with a (cream-colored) t-shirt under it, too. More shirtdresses/shirtwaists are in the works … watch this space for further installments! Oh, this is my favorite of the shirt-dresses so far. (It might have something to do with 17 degrees F right now). It just looks so warm and snuggly. 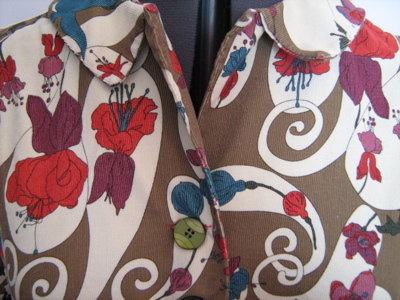 And I love the print (though I might have gone with the teal buttons). Brava! Another lovely creation! I’m so jealous of the fabric. I’m always on the look out for printed cord, but other than children’s prints, it seems to be hard to come by. 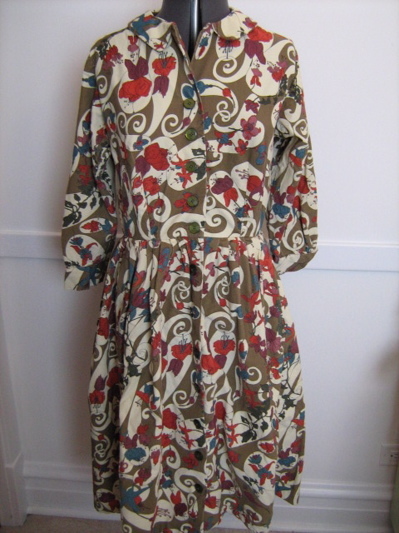 I like this one best, too; it might have to do with the print.I once made an 80’s style shirtdress in a lovely solid salmon-coloured cotton, which needed lots of buttons. The front hung straight down (no darts or anything) from the shoulders (which were dropped) to the mid-calf and its hem curved up to meet the side-seam. The back had a waist seam which secured a big, gathered rectangular skirt panel whose straight hem made right-angled corners when it went upward to meet the curved front hem at the sideseam. So, hem squared in the back; curved in the front. It was a Vogue Individualist something or other. Like a huge smock, sort of.The point is that I had all these different single plastic buttons in versions of salmon, coral red and even clear ones, and sewed them on against the plain salmon fabric to provide a kind of whimsical finish. I’d been inspired by having seen a rural hippie Qubcoise woman wearing a charming cotton dress she’d made where she’d used several different oversized buttons to close the bodice. My creation didn’t work out as well as hers, though. Oh, well. Perhaps it had something to do with my being Anglo-Canadian.However, Erin, if you ever decide to try mixing all different buttons on a shirtdress, I’d love to see the result. I’ll bet YOURS would turn out pretty neat! And if not, you’d write a great blog about it. Liberty is on the corner of Kingly Road in London – maybe that’s why the fabric is called Kingly?Dunno – just a guess! Erin, do you have a favorite eBay store for Liberty prints? Seems like slim-pickin’s there right now. My mom used to make us dresses when we were little out of all her scraps. The sleeves, the yoke, the skirt, the back, the collar would all be different fabrics. My favorite part, though, was always the buttons down the front because they were all different from one another. Hmmm…I really like them all. It’s great to see how different the same dress looks in different fabrics.I love the crazy button idea, for a solid-color dress; must file that one away (I have lots of random vintage buttons too). this is GREAT. and really “in” too, in terms of print and cut. i love it. Very nice! I agree with Nora about a solid color dress with crazy buttons. I think I might do that on my next dress. A am currently making a reversible weskit/waistcoat/vest; one side has three matching army buttons, the other has three odd rhinestone ones. I’ll have to echo what several have already said: You might enjoy a dress with all different buttons. Try it and let us know! I love it too. I would have never thought to use olive buttons on it and they look great. Number 2 is still my favorite. I inherited an obsessive love for fuschias from my grandmother, and I actually have an awful dress made by my mother (must cut that up and reuse all that yardage) in this print but with a grey background instead of brown in satin. We got the fabric at Jo Ann’s. I was so happy to see this dress– absolutely beautiful! I’d love to see a photo or two of how these dresses fit – I too am short waisted and have a terrible time finding dresses or patterns that are appealing.